Cheers from Riverbank Farm, Benalla as Fiscal Fantasy stormed home to an impressive victory in last Friday's Gr.3 Manawatu Breeders Stakes at Awapuni. The classy and consistent mare who trainer Frank Ritchie describes as being "as tough as they come with a heart bigger than herself," is Group winner number two for Riverbank resident Skilled, a Group One winning son of the wonderful stallion Commands. Of course Commands is a grandson of the legendary broodmare Eight Carat and the dark and handsome Skilled has always had a bit of a look of that great influence - making it interesting to note that Fiscal Fantasy is bred on a 3 X 3 cross of Commands' dam Cotehele House. Bred in Victoria by Wingrove Park and sold at the 2016 Inglis Melbourne Premier Yearling Sale, fetching $43,000, Fiscal Fantasy made her way to New Zealand where she quickly found form - placed at two, easily breaking her maiden over a mile at three. Up in class she also won her next start before tackling Group company three starts in a row, not far away without the best of luck. Kicking off her current campaign in the spring, she has had nine runs - a fast finishing fourth her worst result! A winner over 2100m at Waikuku in mid-December, she was in the placings at four consecutive runs before her impressive breakthrough on Friday. Settling well back from an outside barrier, Fiscal Fantasy swung wide into the straight and charged! Little wonder that Frank Ritchie is such a fan of the gutsy mare, in an interview after another of her victories describing her as "the absolute perfect race horse (who) gives you every ounce of what she's got." "I just love her, I'd have her in the living room with me if I could! She is just a little beauty." The Gr.2 Travis Stakes is next for Fiscal Fantasy as she attempts to become Skilled's second two times Group winner, his first being the genuine Joseph Pride trained mare Pecans, winner of six of her 19 starts including the Gr.3 Belle Of The Turf Stakes and the Gr.3 Godolphin Crown as well as the Listed Ladies' Day Cup. The perfect stallion for the owner/breeder, Skilled is a horse who really catches the eye, Riverbank's Dr Caroline Duddy joking that "they don't call him the pretty boy for nothing!" A Gr.1 winner at two of the AJC Champagne Stakes and at three runner-up in the Gr.1 Randwick Guineas, Skilled has not only type and performance - but pedigree as well, being one of the ever reliable Commands (a horse who boasted an outstanding 71.9% winners-to-runners strike rate) 58 stakes winners whilst his dam is the wonderful mare Dextrous. The winner of five of her ten starts including the Gr.2 Sandown Guineas and the Gr.3 Vanity, Dextrous has been represented by seven winners from as many runners including the Group Two winners Ambidexter and Sidestep - both of whom are also doing a good job at stud. Skilled stands at a fee of $3300 (incl gst) with special deals regarding reproductive vet costs on offer. He is part of a strong Riverbank roster, standing alongside Winx's half-brother Boulder City, the consistent Redente, the Caulfield Guineas winner Anacheeva, the VRC Sires Produce winner Von Costa de Hero and the impeccably bred Wayed Zain. The recently revamped Inglis Oaklands Junction complex is already awash with people as inspections for the Melbourne Premier Yearling Sale are taking place - and if you are one of those out there looking your next star be sure to inspect the select draft presented by Nioka Wozny's Moorookyle Park. Known for her keen eye for detail and her passion for everything thoroughbred, Wozny was justifiably proud of her efforts at last year's sale; Moorookyle's four Premier 1 session yearlings achieving an average in excess of $101,000 with highlights including a $120,000 Written Tycoon colt and a $110,000 Malibu Moon colt. Lot 156 b.f Headwater - Eagle's Song (by Proud Citizen): a member of the debut crop of Headwater (whose Magic Millions yearlings sold for up to $180,000), Gr.2 Silver Slipper Stakes winning son of the champion stallion Exceed And Excel and the Gr.1 Oakleigh Plate heroine River Dove, she is bred on the same Exceed And Excel/Gone West cross as 14 stakes winners including the multiple Gr.1 winner Guelph. Her dam (a three times stakes placegetter whose first three foals are all winners) is an imported mare whose sire is the high class Proud Citizen (sire of 43 stakes winners) and whose dam is a daughter of the Gr.1 mare Nice Tradition, dam of the stakes winners Raise A Tradition and Nice Serve and second dam of the stakes winners Meisho Bowler, Meisho Yataro, Two Months Rent, Transition Time and Dynasharp. "She is a Classic type filly who is good sized and correct with a great temperament," Wozny said. Lot 429 ch.f Jimmy Creed - Scorpio Queen (by Choisir): by Spendthrift Stud's exceptionally good looking Group One winning son of Distorted Humor, a young stallion who has made such a great start in the northern hemisphere with 70 of his first 115 runners being winners, eight of those (7%) at stakes level. This filly is the second foal (her first, a $140,000 Deep Field colt, is in work with Mick Price) for a classy race mare who won five races including the Listed Gold Coast Bracelet and the Listed Bernborough Handicap along with three Gr.3 placings. Hailing from the family of the triple Gr.1 winning sprinter Toledo, this filly has an exciting pedigree with crosses of the excellent mares Natalma and Mixed Marriage. "This is a filly of great size, scope and strength with a straight forward, sensible temperament." Lot 660 b.c Smart Missile - Little Diamond A (by Dixie Union): a son of one of Australia's most popular stallions who has been doing a great job with eight early stakes winners, this colt is a half-brother to three winners out of an imported daughter of the high class broodmare sire (34 stakes winners) Dixie Union and the terrific broodmare Izana, dam of the stakes winners Mi Amigo Guelo and So Elite and the five times stakes placed Tina Bull. Izana is a daughter of the wonderful Mr Prospector mare Tersa, European Joint Champion 2Y0 Filly; dam of the dual Gr.1 winning successful stallion Rock Hard Ten and grandam of the local Gr.1 winner All American and Gr.2 mare More Strawberries. Boasting a cross of Smart Missile's fifth dam Rough Shod II, this fellow hails from an outstanding international family. "He is typical of the Fastnet Rock line, a great looking colt with plenty of substance, size and scope." Lot 689 b/br.f Ready For Victory - Miss Shakira (by Snippets): bred on the successful More Than Ready/Snippets cross (one that provides for crosses of the great mares Almahmoud, Striking and Lavendula II), she hails from the debut crop of Sun Stud's fast and classy Ready For Victory whose grandam is a half-sister to the champion Rubiton. Her dam Miss Shakira is a proven broodmare with her seven winners including the speedy Listed winner Tropic Thunder (by Ready For Victory's champion sire More Than Ready) - and her family is a strong one with her relations including the feature race winners Rebel Raider, Shamoline Warrior, Cadillac Mountain, Haybah, Jungle Edge, Brief Kiss, Gaily Funky, Brave Warrior, A Little Kiss and Blueberry Hill. "A 3/4 sister to a stakes winner, she is a well balanced filly with great size and strength and a lovely attitude." Lot 773 ch.f Toronado - The French House (by Dylan Thomas): sons (Dundeel, So You Think) of the much missed High Chaparral have been in great form of late and the dual Gr.1 winner Toronado has made such an encouraging start to his stud career with 25 debut crop winners in the northern hemisphere. And local trainers love him with his yearlings selling for up to $340,000. This striking filly (bred on the same High Chaparral/Dylan Thomas cross as NZ Derby aspirant Cutadeel) is the first foal for a talented race mare who followed up a dominant maiden victory with close up and very unlucky fifths in two Listed events, considered a major contender for the Gr.1 Australasian Oaks only to be injured in the lead-up. Her dam is the stakes placed dual city winner Deraismes whose four to race have all shown good ability; her other three Geodesic (three in a row last time in), Maigret and Marie Adelaide (last start 2 1/2 length maiden winner) all saluting within the last eight months... and in all back in work and progressing well. A descendant of the famed champion Pretty Polly, Deraismes is a daughter of the imported Listed winner Assertive Lad, half-sister to the globe-trotting two times Group winner Guiza, in turn dam of the Gr.3 galloper Drama Critic. The product of a planned mating, this filly boasts crosses of the outstanding mares Natalma, Doubly Sure, Somethingroyal, Mixed Marriage and Relance. "She is a correct, strong filly with nice movement - very much true to the Toronado type." Check out the Moorookyle draft in Barn E, stables 58 - 62. The first Tuesday in November, 2001. Flemington. What better date, what better place for a first date? Rebecca Hodgson and Simon Lurati had both grown up around horses, they had met not long previously at a Riding For The Disabled event. As they cheered home Ethereal to her historic Melbourne Cup victory, they realised they had quite a lot in common and they have been together ever since. At the time Rebecca, along with her father Peter Hodgson (one time strapper to Gala Supreme), had already been operating the highly successful Dallu Welsh Stud for nine years. Family legend has it that she was just six weeks old when she first sat on a horse (one that happened to be a thoroughbred) and she worked her way through pony club and competitions through to breeding over 180 Welsh Mountain Ponies who have competed with distinction around the country. Simon did not have quite such a full on equine upbringing but was still around horses from a young age, his mum taking him to Uncle Nev's riding school near Whittlesea and from then on he always had horses around. Whilst concentrating on the Welsh Mountain Ponies (several of whom call major Victorian studs their homes, proving to be ideal teasers), the couple - who married in 2010 - always had in the back of their mind that one day they would make the transition to thoroughbred breeding. It was just a matter of time and place. And that time was June last year, the place - Ealing Park, Euroa. Having run Dallu Welsh stud on 500 acres just down the road at Tamleugh, the pair knew Ealing well; in fact whenever they had driven past it they had thought it would be ideal for them. Well at least that is what Rebecca thought, Simon at first not so keen! But she worked on him for a few years and once he had inspected the farm he had to agree that it was perfect. "We had looked at a few other places but I had my heart set on Ealing," Rebecca said, "I just love the place." Taken with how Ealing was already perfectly set up ("some work needs to be done but the bones of the farm are so strong"), Rebecca and Simon were also appreciative of the farm's long history. The front yard at Ealing is the burial ground to two winners of major races in different hemispheres - the 1966 Epsom Derby winner Charlottown and the 1990 Melbourne Cup hero Kingston Rule. Whilst Charlottown stood at the property pre-Ealing (it was run as Summerhill Stud in the 1970s) Kingston Rule retired there from the track, siring the Group One winners Sheer Kingston and Kensington Palace. Ealing was for over two decades run by the Johnson family, established in 1983 by Geoff and Mary Johnson who both boasted impressive records to Australian racing history; the Johnson family breeding and racing Vain whilst Mary's maiden name was Cox... yes, that Cox! And so racing breaths through the soil at Ealing and the Luratis are looking forward to continuing on with this great thoroughbred tradition, happy to welcome new clients as they prepare for their second spring in operation. "We took things quietly the first year as we wanted to concentrate on improving things. The fencing and stables are still good though but the pasture needs a bit of work so we will be resowing this autumn." The couple had a nice practice run last spring, Riva Ridge Stud - breeders of the dual Group One winner Viddora - sending mares over to be walked into nearby studs. "It was nice to be trusted by such a successful breeder," Rebecca said, adding that she and Simon both thoroughly enjoyed their first season at work at Ealing, despite a couple of very early starts. "One morning we were up at three to get a mare to Woodside for the first covering of the day," she laughed, "but we really enjoyed the walk-ins, it was all so interesting." Foaling down is the task Rebecca most looks forward to - "I really love the breeding side, welcoming new foals but also the research that goes into the planning; taking type, conformation and pedigree into consideration - all the same principles we applied when breeding the Welsh Mountain Ponies." As well as being horse people, Rebecca and Simon also enjoy the company of other horse people and aim to make Ealing Park the sort of place where breeders and owners can feel comfortable visiting. "We want to stay very much a family run farm," Rebecca said, noting that it enables her and Simon not only to keep a close eye on things, but to keep overheads - and therefore prices - down. "We want everything to have the personal touch," she added, laughing as she recalled the first time seeing her seven-year-daughter mix feeds in the morning - "now she hops on her pony and follows me around as I do the feed run!" Serviced by Seven Creeks Equine's Stacey McGregor who is renowned for her work with preparing mares for cover, Ealing Park is ideally situated in the heart of Victoria's prime thoroughbred breeding area. The Luratis are offering introductory rates for new clients and are happy to show potential new clients what is on offer at Ealing Park. 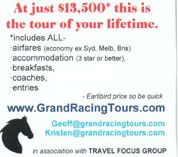 For further information give Rebecca a ring on 0427 736 662 or visit www.ealingpark.com.au and https://www.facebook.com/ealingpark for further information. Just imagine yourself at Royal Ascot in 2019, in awe of witnessing the European superstar Enable in action, maybe even cheering on a few Australian horses such as Santa Ana Lane, Trapeze Artist, The Autumn Sun or Redzel and last year's Melbourne Cup winner Rekindling who has the Ascot Gold Cup in his sights. 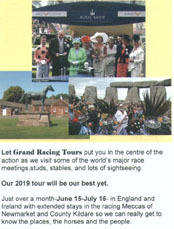 And if that is not enough, Grand Racing Tours' 2019 exciting trip to the UK also encompasses the Irish Derby at The Curragh and the July Cup at Newmarket with many a stable and stud excursion along the way. Such as time at The Queen's Royal Stud at Sandringham and Michael Owen's Manor House Stables plus visits to the English and Irish National Studs and the Tattersalls July Sale as well as the famously beautiful Newmarket gallops and the internationally acclaimed Palace House National Horse Racing Museum. "It has been a real pleasure to meet Geoff's tour groups and get swept along by their fun and enthusiasm," Lissa said, adding that she was "green with envy at the places they'd visited and the people they'd met. Everyone had become close friends along the way and they made me feel so welcome; I look forward to meeting the 2019 group." "I am delighted to hear that Geoff will be bringing a tour party to Newmarket," John said, "especially during the best week of the year here; not only is the racing top class, it is a week during which Newmarket comes alive with the sales and all the social events going on." THE Racing Australia syndicate that owns 10% of Douro Valley, winner of the Yalumba Stakes at Caulfield on Saturday, has 18 members. That means each gets 0.55% of the $240,000 first prize, or a little more than $1300. Actually, you have to take 15% from that — the standard 10% to the trainer and 5% to the jockey — so each pockets just over $1100. To win a group 1 race, however, is priceless, and syndicate manager Kristen Manning and many of the Racing Australia members celebrated like celebrating was going out of fashion. Manning even raised the large trophy over her head in a group photo. "This is something you spend your whole life dreaming about," she said. "This is Australia No. 1 syndicate, our first. We bought a share in a General Nediym filly who was no good and then we got offered a share in this lovely horse." "Lovely" is an apt description, with Douro Valley's eight wins, seven seconds and seven thirds from 48 starts helping bring the syndicate a small share of more than $1.1 million prizemoney, and lots of fun, especially this time last year when Douro Valley beat Maldivian in the Naturalism Stakes to get into the Caulfield Cup, in which he ran second to stablemate Master O'Reilly. Racing Australia is on a roll, because just seven days before the Yalumba its No. 4 syndicate, with 12 members, won a race with Hard To Miss. That win provided the biggest cheer in the press room at Flemington on the day there were six group 1 races in Australasia. It was only a maiden at Murtoa — it was shown on television — but it didn't stop wild celebrations from Manning, husband Vin Lowe, who works for the Moonee Valley Racing Club, and a handful of racing photographers in the syndicate. The 12 each picked up 8.5% of 10% of $5850, less 15%. In comparing that win with Douro Valley's, Manning said the feeling on crossing the line was similar but afterwards the Douro joy was much bigger. Owning not much more than a few hairs in the horse's tail did not lessen the thrill. "Actually, it's better because we're sharing with such good people," she said. Manning now manages six syndicates, which have had four different winners. "I think he's the best by a long way," she said of Douro Valley. Jockey James Winks, clearly, ranks Douro Valley as his favourite horse. The Yalumba was his first group 1 in Melbourne and his second overall, having won the Winter Stakes in Queensland mid-year on Absolut Glam, who, as with Douro Valley, is trained by Danny O'Brien at Flemington. 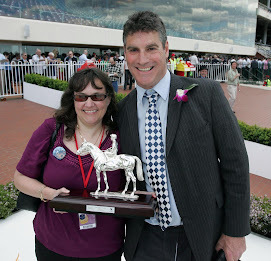 Kristen and Vin with the 2008 Yalumba Stakes trophy after Douro Valley's courageous win.